One variety which I like in Dosa apart from the above mentioned is Pesarattu. I always used to wonder why is this not mentioned under Dosa category in restaurant menu. Soak MoongDal overnight in sufficient water. Grind it to Dosa consistency the following morning, using water as required. 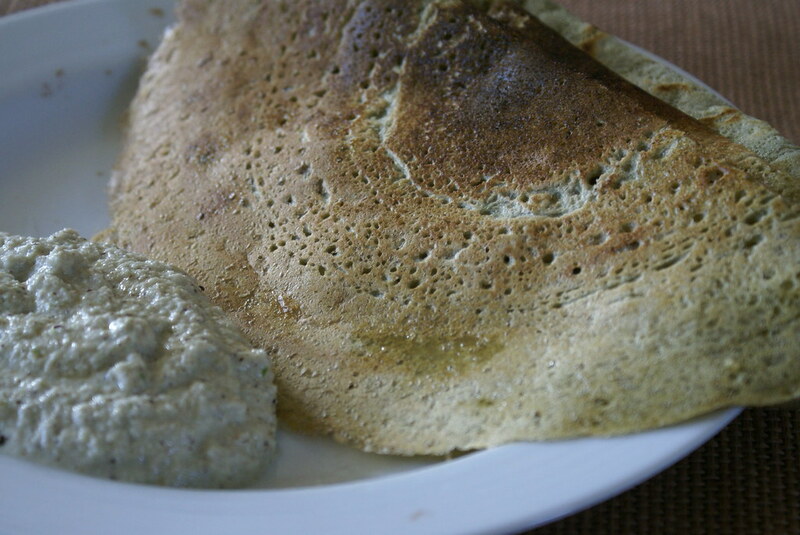 There is no need to ferment the Pesarattu Batter as we do it for regular Dosa. Take a Dosa tava and when hot put a ladle full of batter and spread it. Mix all the ingredient mentioned under topping, and put a spoonful on the dosa. Put oil on the sides and on the dosa. Let it fry till crisp. There is no need to turn over. A very wholesome, nutritious and delicious breakfast… Just Yummyyy!!! This is my entry for the Dosa Mela event being hosted by dear SriValli of Cooking For All Seasons. I make this too but mix the green chillies, onions and cilantro into the batter, before spreading on the dosa pan. Its delicious. congratulations and good to have you back 🙂 the pesaruttu looks fab! Yum, looks good! I love to get these all gigantic in the restaurants. Hey, I too always order dosa but only when I am in Coimbatore, B’lore or Mysore!! That looks inviting!! Hey! I missed you! Welcome back, Cinnamon mom-to-be :)) Heartiest congratulations! Congratulations on the good news… Take care of ur self….Onion pesarattu was a nice entry…..